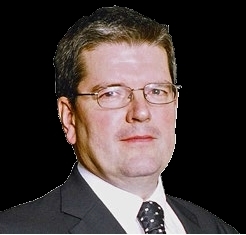 At the launch of Mitsubishi Electric’s fifth generation of Ecodan air source heat pumps in Scotland late last year, John Kellett highlighted the potential growth in the renewable sector, pointing to the opportunities for air source heat pumps in particular. Proactive heating installers looking to expand their business are always on the lookout for new ways to differentiate themselves from the competition, and many will have already looked at what the renewable heating sector has to offer. In the renewables sector, a 2014 report from BSRIA (Building Services Research and Information Association) uses quarterly sales figures from all manufacturers to create an insightful look at the market. Incorporating 90% of all the registered units being supplied into the market, the BSRIA data provides a completely independent, facts-based analysis of the current and future potential. Interestingly, BSRIA forecasts that the overall renewable market is likely to rise from £225m in 2013 to £684m in 2017, so there is real potential here for anyone willing to invest in acquiring the skills necessary to take advantage of this growth. Beyond 2017, increasingly tough legislation is only going to make the market even more favourable for renewables when the need for low carbon heating for our homes increases. Which technologies will grow the most? 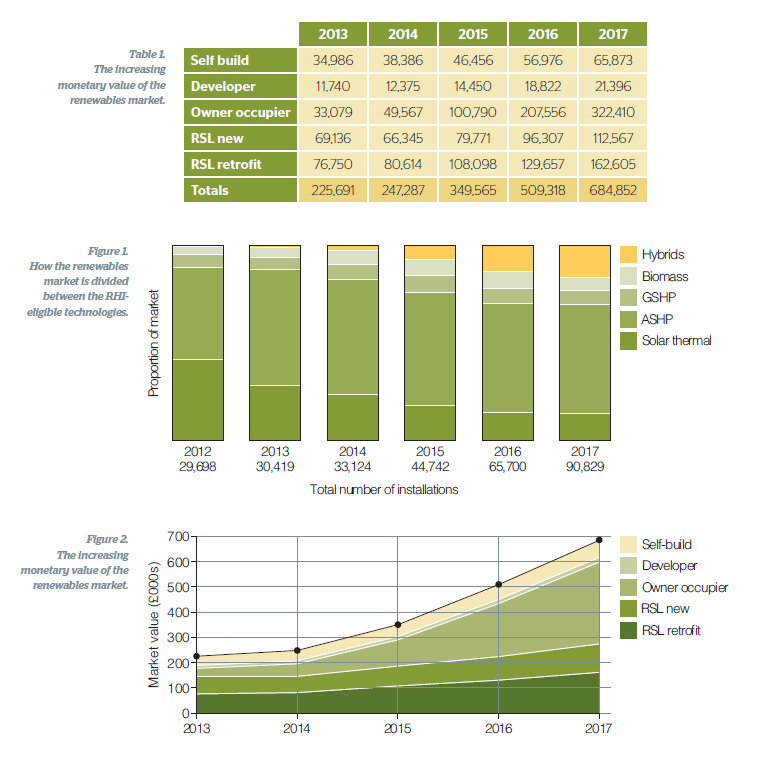 The BSRIA figures show growth for all areas of renewable heating with the exception of solar thermal – with 2017 levels predicted to be similar to 2012 at 12,000 to 13,000 units a year. By far the biggest growth prediction though is in the heat pump sector. There are many reasons for this – not least the ease with which heat pump systems can be operated and maintained. Advances in controls – including Wi-Fi internet operation and systems that feature automated weather compensation and intelligent room sensors – also mean that heat pump heating is easier for the homeowner and fits in well with modern lifestyles. In the heat pump sector itself, the BSRIA figures also show that the fastest growth by far is in air-to-water heat pumps (125%) – compared to ground-to-water (97%), air-to-water split heat pumps (87%), and exhaust air-to-water systems (50%). Eight years ago, when the Ecodan was first launched by Mitsubishi Electric, it was clear that the route to mass market acceptance for heat pumps was to make them accessible to the current army of heating installers. This is also borne out in the recent BSRIA figures, which show that 55% of the sales of heat pumps are directly to plumbers and heating installers, while a growing number (41%) are through wholesalers. 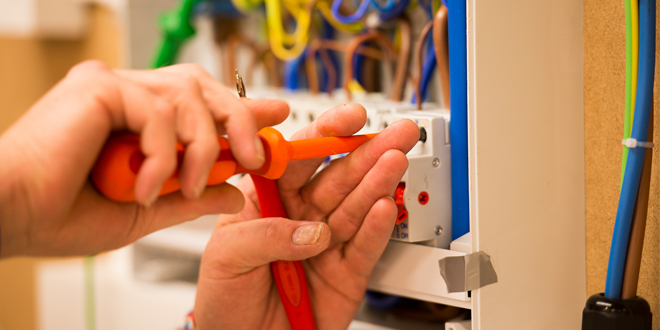 As a manufacturer, it is crucial to welcome anything that makes it easier for installers to get hold of advanced technology that can give them another option to offer customers. It is necessary, then, to work with wholesalers to ensure that any MCS-accredited heating engineer can source products that customers want. We also decided eight years ago to offer the market a monobloc system, which can be fitted by any qualified heating engineer. 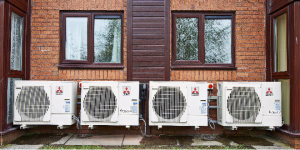 We’ve also taken skills from the commercial air conditioning sector and we have a range of split heat pumps, which need F-Gas qualified engineers to install them. However, we realised that we had to deliver systems that could readily be installed by suitably qualified and experienced heating installers, as well as offering a new market to F-Gas engineers. Breaking down the BSRIA analysis further, it shows that monobloc heat pump sales for units under 10kW have already grown 122% in the domestic sector. Similarly, sales of 10kW–20kW domestic units have also grown by 130% while commercial use of heat pumps has increased by 176%. The figures further show that the vast majority of the growth in monobloc units (79%) has been in low temperature systems (under 60°C). from 18,000 in 2013 to over 50,000 in 2017. While 76% of current sales are standalone systems, 20% are boiler assisted/hybrid systems – so this is predicted to become an increasingly important sector. These hybrid installs – where the heat pump is fitted alongside a gas, LPG or oil boiler – are also predicted to grow from a current low of 745 installs last year to almost 15,000 in 2017. More and more people are using a heat pump for the majority of the time to control energy costs while keeping their traditional heating as a backup or for the rare extremes of cold. The biggest growth area is still predicted to be the social housing sector (both new-build and retro-fit) – accounting for just under half of all anticipated growth. There are also predicted to be sales in the house-building sector, but – as with the self-build sector – these will only account for a few thousand per year. The biggest individual growth sector though is predicted to be owner occupiers, rising from 1,800 units in 2013 to 19,000 units in 2017, which is starting to be driven by the RHI introduction. In financial terms, while there is predicted growth in all sectors, the owner occupier offers the greatest potential for the installer base and is predicted to rise from around £33m in 2013 to £322m in 2017. Beyond 2017, as increasingly tough legislation further improves the market for renewables, air-to-water systems will be best placed to meet the new demands. This, therefore, represents a significant opportunity for installers ready to tap into it – especially as the domestic RHI starts to help facilitate the required market growth into the 2020s. The prediction is that by 2030, over 5 million ASHP systems will be installed in the UK generating 41,142MW of heating energy for the nation. 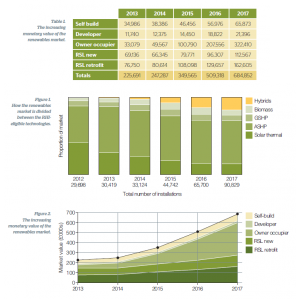 The question is whether installers will be ready to meet that demand by growing their renewable business. John Kellett is General Manager – Product Strategy & Marketing for Mitsubishi Electric, having has spent the last ten years with the Hatfield-based company. During his time at Mitsubishi Electric, John has worked in controls development engineering, through technical support to become National Operations Manager. He was also General Manager of the Heating Systems Department before moving into his current role.